What is the difference between audio transcription software and speech to text software? A speech to text software allows the user the user to talk into a microphone at their computer and what the users says is then typed out in a text document. Dragon NaturallySpeaking learns your voice over time, making the speech recognition very accurate, and you give the software grammar commands to end sentences & start new paragraphs.This is called dictation software. Why use speech to text software? You have problems typing and need assistance. You’re somebody who does long dictations such as a doctor, lawyer, or academic. Speaking is much more natural than typing out what you’re thinking. Your hands will be free allowing you to multitask while you dictate. Transcription software is different than speech to text software. For example, Express Scribe allows the user to load an audio or video file and play it back, using either keyboard hot keys or a foot pedal, and then the transcriber types the words they hear into a text document. Also, the main difference is dictation software can only recognize one voice at a time. A lot of audio files recorded, for example by video production companies or a university will have multiple speakers. Dragon will not be able to recognize five different speakers at a conference, or even two people for a sit-down interview. In summary, if you’re a transcriber looking to get started always buy transcription software before you try speech to text software. Express Scribe is a good choice if you’re starting out as a transcriber. It’s free to try and a license is usually between $30 and $40. 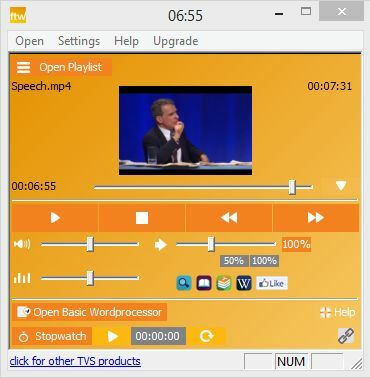 It’s intuitive and easy to use, it works on both PC & Mac computers, and Express Scribe loads basically all audio & video formats for transcription (MP3, WAV, WMA, MP4, MOV, WMV, etc.) without a problem. If you’re looking for an alternative to Express Scribe, another great option is FTW Transcriber. They usually respond via email in the same day and will even make changes or additions to the software upon request. Very affordable pay as you go price plan. You can try the software for $10 for one month, or sign-up for two years at $1/month, or $24 total. Sorry, no Mac version available, FTW is Windows only. Due to the positive response of this blog article, FTW kindly offered us a discount on their software. If you have any questions please feel to contact us. Take care & happy transcribing! Hi! I’m just starting out and have started practicing with Express Scribe. I’ve very quickly realized the convenience of a foot pedal. I want to get one as well as a headset, but am at a loss of what will be compatible. I’m currently looking at an Olympus AS-2400 Tanscription Kit,…but how do I determine what is compatible with my Windows laptop & this specific software? Thank you in advance for your help! I’m puzzled by the benefits of transcription software. If you still have to do all the typing, what are the benefits? I have literally 50 hours of taped interviews to transcribe for a major project and am clearly in need of the most convenient and accurate means of getting this done. Cost, of course, is an issue. Your counsel is most welcome. Thanks again for reading the article! I responded offline via email. One more question for you. I have a MacBook Air and per reviews I see there can be some issues with getting enough power to the foot pedal Amazon packages with ExpressScribe. Are you familiar with this problem? Is it common? Should I go a different direction? I really appreciate your willingness to provide answers to my pesky questions. Unfortunately I haven’t heard of this issue with the MacBook Air. Sorry I don’t have any input on this. I have a similar question regarding transcription much like Craig asked. I am going to interview roughly 30 folks for about 1 – 1.5 hours a piece over the next 45 days. Is there not software that will assist with typing the speech for me, or do I have to transcribe it all manually? Thank you in advance! You could try using Dragon as others have mentioned, I personally haven’t used it in a while, but I’ve read it’s better at speech detection for multiple voices than it used to be. Dragon could get a rough transcript created and then you go back and edit it yourself. Alternatively you could also hire somebody to assist you in transcription. The main thing with automated transcription (or even hiring somebody) is you have to make sure the audio quality is near perfect. If it’s muffled or the people are not mic’d up then any sort of automated transcription would be sub-par.